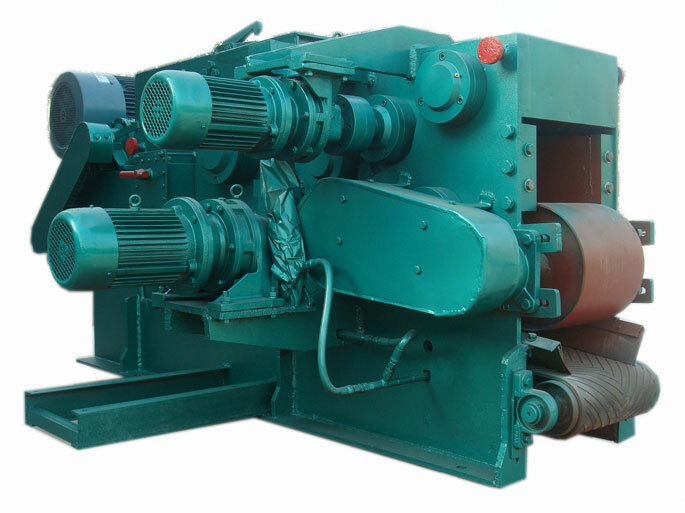 Wood chipper, also called tree chipper, is a basic machine in all kinds of industries which may need wood materials, such as biomass pellet industry. It can shred the raw materials (such as logs, branches ) with a diameter below 200mm and a length below 1000mm into small wood chips for the further processes in a compelet pellet plant, for instance, grinding by hammermill, pelletizing by pellet mill. In order to comply with the requirement of build a high efficiency pellet plant in a short time, GEMCO now provides you a industrial drum wood chipper. The GEMCO drum wood chipper is consist of engine base, knife rolls, top and bottom feeding device, conveyor, hydraulic buffer system, and electrical control system. The engine base is made of high strength steel sheet, it is the foundation of the machine. With the purpose of putting the bottom knife holder, the support part of the knife holder and the engine base are welding together. The resized wood particles will pass through the sieves holes, and be discharged through the bottom of the engine base. The larger wood particles will be shreded again by the cutter which is mounted on the engine base. The knife rolls is the main working part of the wood chipper, it is welded by steel sheet so that it maintains a good rigidity and moment of inertia. Further more, it has passed the dynamic balance test. The mainshaft and the knife rolls are connected by a locking device or a flat key, it provides the wood chipper not only a simple structure, but also easy to assemble and reliable to operate. There are two fly-cutters fixed on the knife rolls by using the specially made fly-cutter bolt via a thrust piece. The feed roller of Gemco wood chipper has a larger diameter, heavier weight and some coarse tooth on the surface. Therefore it can compress the raw materials, and keep a balanced speed to feed the raw materials into the chamber to ensure the quality. The teeth of the top and bottom feed rolls are interlaced, so that the chips can be better cleaned. There are two types of conveyor, belt conveyor and vibratory feeder.